After modest beginnings, Gladstone in the late twentieth century became one of Queensland's fastest-growing towns, drawing its strength from coal mining and other industries, and a flourishing export trade, especially to Japan and China. Located 430 km from Brisbane, it was named in 1853 after the English Chancellor of the Exchequer and future prime minister, William Ewart Gladstone (1809-98). Ninety kilometres south of Rockhampton, Gladstone is a coastal city. Gladstone was originally known as Port Curtis, which was named by Matthew Flinders in 1802 after Sir Roger Curtis who had been Commandant at the Cape of Good Hope when he had called there for victuals and resupply. Port Curtis enjoyed a brief three months of temporary settlement as the administrative centre of the colony of North Australia (1847). George Barney (Barney's Point, Gladstone) commanded the settlement but a change of government in England led to its disbandment. Within a few years pastoral occupation of the hinterland brought about pressure for the port to be a livestock shipping outlet. In 1853 the town of Gladstone was surveyed and the first sale of town and suburban allotments took place the following year. Gladstone served well as a harbour, but the absence of plentiful water and agricultural land hindered its development. A gold rush at nearby Canoona (1858) then overshadowed Gladstone for a period. Although declared a municipality in 1863, Gladstone's growth was slow: a customs house was erected in 1860, the first school in 1864, a Presbyterian church in 1869 and Catholic and Church of England churches in 1874. Gladstone's wharves were at Auckland Point (named after the ship Lord Auckland that brought the first European settlers in 1847), where Auckland Inlet enters Port Curtis. The short waterway involved navigating a strait which was obstructed by submerged rock and passable only at high tide. Intermittent blasting and dredging went on until the 1890s in an attempt to improve access through the passage, with less than adequate results. Funds were spent on alternative harbours at Port Alma and Rockhampton, leaving Gladstone's population convinced they were being unfairly overlooked. Further impetus came in 1906, with the opening of the Port Curtis Dairy Cooperative. After years of scrub clearing dairy farming had finally achieved critical mass, and the railway transported dairy produce to the factory. Gladstone remained convinced that it had the best potential shipping harbour in central Queensland. The state government appointed the Gladstone Harbour Board in 1914, and the town formed its own Gladstone Harbour League to lobby the Railways minister for fairer haulage rates and for freight from surrounding shires. Progress was slow, and the town's economic mainstays remained the Port Curtis dairy factory (which achieved maximum production during the 1940s-50s) and the meat works. Tourism was still a distant prospect, although Heron Island emerged as a local holiday destination in the 1930s. Flying boats, bound for Singapore and connections to England called at Auckland Inlet from 1935 and a land aerodrome, jointly backed by Gladstone and Calliope Shire, opened in 1956. World War II years saw reduced throughput for the port. However the postwar boom was to deliver circumstances allowing for a realisation of Gladstone's belief in its potential as a port. The first significant upturn was the shipping of Callide Valley coal in 1948, followed by Blackwater coal and grain shipments. In 1962 the Commonwealth Aluminium Corporation Pty Ltd (Comalco) announced its intention to build an alumina refinery at Gladstone for its bauxite from Weipa, on the Gulf of Carpentaria. The project injected hope into the community, offering some relief after the closure of the meat works in the early 1960s. Production at the refinery began in 1967 and by 1973 two expansions had made it the largest alumina refinery in the world. Power for the refinery came from the Gladstone Power Station (1967), fired by Callide and Boundary Hill coal. Coal for Japanese contracts had been shipped through Gladstone since 1959, and in 1968 a railway line from the Moura open cut mine to Gladstone opened. By 1980 coal was 47% of the port's cargo throughput, and in 2000 it was over 65%. The Gladstone power station was expanded, reaching maximum capacity in the early 1980s and generating over half Queensland's electricity. In 1981 Queensland Cement and Lime opened a clinker plant: the cement clinker, produced in a kiln from limestone and other minerals is ground with gypsum and makes cement. Just outside Gladstone, on Boyne Island, another aluminium smelter opened in 1982, its employees swelling Gladstone's metropolitan population by several thousand. A chlorine and cyanide plant opened in 1989. Gladstone's population increase from about 6000 to 20,000 in the period from 1960-80 strained the social fabric and local infrastructure. It was branded a slum and caravan town. Water supply and sewerage were the Council's first projects, the surfacing of dusty streets left to wait. The Council found that battling on alone was not enough, and extracted financial assistance from the State Government and development contributions from new industries to fund a town plan, hostel, a caravan site, recreation facilities, a new hospital and an extra high school (1981). In 1976 the town was proclaimed a city. Ten years later, after strenuous efforts to answer the slum critics, Gladstone received the first of several Tidy Towns awards. By then much of the frenetic industrial construction was completed. There had been time to build a public square and City Centre Plaza (1982), and the town hall (built in 1934 in the depth of the Depression) was converted to a museum and art gallery. A Civic Beautification Committee (1971) enlisted numerous service organisations for voluntary landscape and beautification work, including the surrounds of the Awoonga Dam, a storage enlarged several times to service Gladstone's industry and growing population. In 1988 the Tondoon Botanic Gardens (83 ha) opened, specialising in endemic plants. Gladstone's growing need for industrial and port land has been partly met by the reclamation by landfill of tidal flat foreshore, enabling industrial expansion near the port. In 1990 there were 18 km of foreshore and waterway shoreline reserved for port activities, which include facilities for bulk coal, grain, clinker, bauxite, petroleum and chemicals. Gladstone is a regional education centre. In addition to State and Catholic primary and high schools there is a University of Queensland campus near the marina at Auckland Inlet, and a TAFE. Near the centre of town is a reminder of pre-industrial Gladstone, the showground (1915), next to Gladstone State High School (1953). The racecourse, golf course and rugby league ground are to the south, near the airport and the Kin Kora drive-in shopping centre (1977). Goondoon Street in the city centre is Gladstone's main shopping strip, with the recent addition of the City Heart centre at the Tank Street corner. There are also drive-in shopping centres in Toolooa Street, South Gladstone and on the Dawson Highway at West Gladstone. In addition to the shops, Goondoon Street has four heritage-listed sites: the Catholic church and school (1920s), a former Commonwealth Bank (1920s), the former town hall, now the gallery and museum (1930s) and the former post office (1924). The Port Curtis dairy complex in Short Street is also heritage-listed. By 2008 Gladstone City Council administered an area of 163 sq km. 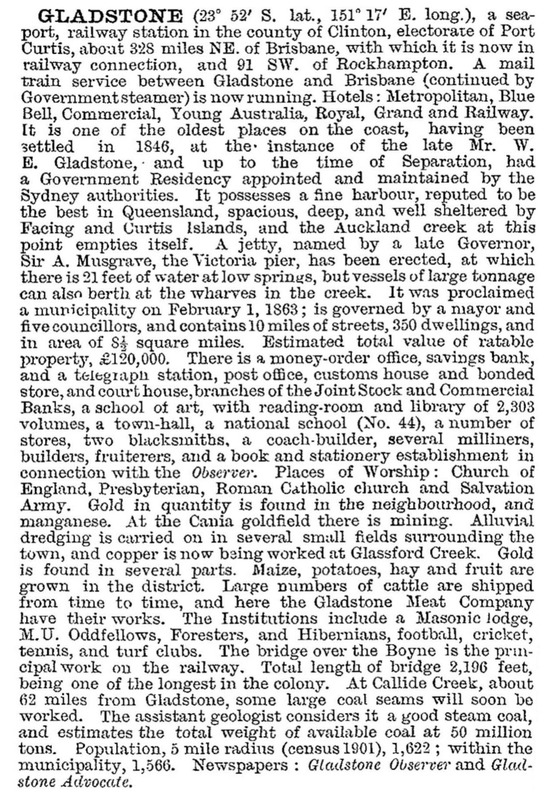 In that year it was amalgamated with Calliope and Miriam Vale Shires to form Gladstone Regional Council (10,488 sq km). The new council also absorbed the Gladstone Calliope Aerodrome Board.